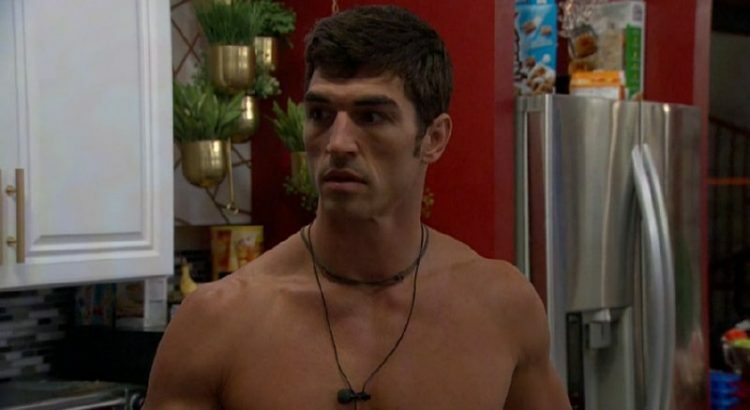 Big Brother 19 Participant Alex Ow. Best known for being nice to other house guests and for generally being a strategic mastermind. She made it to final 4 that season. 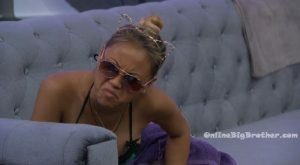 It’s been universally accepted she threw her game away for Paul Abrahamian. In her words, because of “Friendship”. 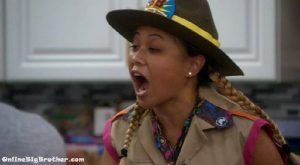 Alex Ow is known for her concern about other houseguest dermatology, Psychologically profiling predators, and generally making a big deal about the important stuff. Alex – this is going to be a tough tough house to beat. Kevin – to get to the end? Alex – yeah because all of these people have other people to hide behind. Kevin – why won’t I make it to the end? Why am I not in their circle? Am I not a circle person? Take a look I’m a circle. Alex – he says he has a plan and I should trust him … but I don’t trust him any more. Kevin – why did he put you up then? Alex – that’s just it I didn’t think I was going up. I prepared Jason for it and then I saw my face up there. He wants me to bow down to the queen. Paul asks Dom – who do you think is tight? Brain-wise? Dom – I trust Cody. Although, thinks don’t make sense, I trust him. I’ve seen people like him. I’ve worked with people like him. I trust him. emotionally he is stable. Christmas is smart. Dom – what I do know is that people are starting to crumble. People are wondering what is going on between him and Alex. There is absolutely nothing… I did confirm. Jessica joins them. Jessica – he told me that we all need to stop being pu$$ies. Dom – so basically we go out there and dominate. Jessica – its not that I’m scared of her but if she can beat one of us, then she’s a threat. Alex – Megan ruined our game. Josh – she did. Alex – all of our games. She tried to throw a racist thing in there. It’s 2017! Kevin – is that what she said that you said something racist? What happened?! What happened there? 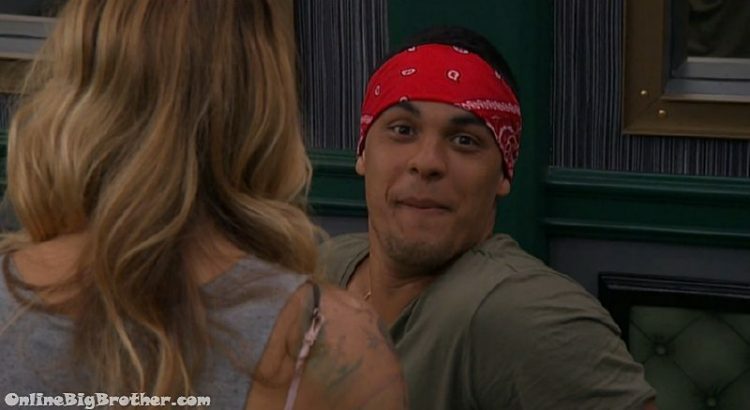 Alex – when I was talking to Cody at the pool all those girls were like ohhh.. go get your man. And I guess Jessica said I don’t want to go over there because the f**king panda is over there. And I thought it was like because I was wearing a black and white bathing suit. It turned out that it wasn’t true and she made it up. Jessica is snuggling up next to Cody. Raven – did a fish actually die? Jessica – no, they took one. They’ll probably take one every time someone leaves. Raven – ohhhh. Cody – do you think they’ll take mine when I leave? Jessica – you mean at the end. Jessica then kisses his chest. Matt – how much do the live feeders pay? Jessica – 10 or 15? Raven – isn’t it less or more without the commercials. I can’t remember. 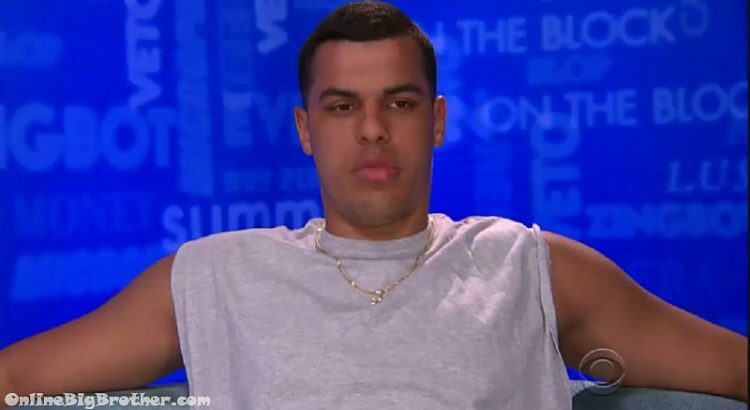 Cody – I remember one of the years that this was out and I attempted to watch the live feeds and I was f**king bored out of my mind. that will be competing for the half a million dollar grand prize. And even though the we can’t watch what’s happening inside the big brother house, the competition has already started. The house guests have already moved into the house as they need to start getting the footage for the premiere.